The Addams' Family Mansion … The Munster's place on 1313 Mockingbird Lane… That li'l old colonial horror in Amityville… We took inspiration from these creepy abodes and infused home improvement with a horrifying Hollywood twist – all to help American Movie Classics promote Monsterfest, its annual Halloween film festival. Most of the programming slated for AMC's Halloween festival revolved around haunted domiciles, including the cult film, The House on Haunted Hill, and "Hollywood Ghost Stories," an original hour-long special profiling Tinsel Town's evil bounty of haunted landmarks. AMC once again came to us to create a publicity stunt offbeat enough to capture the attention of the public, the media and their cable affiliates, while reinforcing the theme of the festival and driving overall viewership. Our approach to the assignment was to take a tried-and-true concept – the makeover – and vamp it up to sublimely extravagant and surreal proportions. The result: AMC's House of Horrors Sweepstakes. The sweepstakes' grand prize gave one lucky family the chance to have the exterior of their home, their front yard and even their Halloween costumes bumped up to big screen scare standards by real-life Hollywood pros: the set designers and make-up wizards behind the film, Nightmare on Elm Street. To further the appeal and press-worthiness of this spectacular $150,000-plus haunted creation, we convinced AMC to enlist Linda Blair of The Exorcist fame to spend Halloween with the winners at their outrageously remodeled home. There, the actress both opened the door to greet unsuspecting trick-or-treaters and hosted a Halloween night party for the winners and 25 friends. Blair also served as the ideal Halloween season media bait – the perfect pick for national spokesperson for this offbeat sweepstakes and AMC's weekend-long Halloween festival. This extravagant promotion was launched with an aggressive multi-layered marketing support, including national print and spot television advertising, a sub-site at www.amctv.com, promotional materials with the Loew's theater chain and massive publicity with Blair as its centerpiece. Cataldi PR also helped AMC shore up relations with another important audience – its cable affiliates – by orchestrating local sweepstakes with over 100 cable systems. Each sweepstakes gave cable subscribers the chance to win a professional makeover for Halloween and a limo ride, including a catered meal on-the-go, to an extravagant night of trick-or-treating. The bulk of the massive wave of national media attention came throughout Halloween week, when the winning family, the Mannings of Dallas, were whisked off to New York for a three-day horror-themed vacation. While they enjoyed visits to sites like Jeckyl and Hyde (the Broadway play and the theme restaurant), a team of 12 Hollywood effects pros, led by Nightmare on Elm Street set designer C.J. 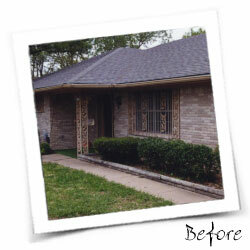 Strawn, transformed their ranch home into a two-story house of horror. Their house and front yard were outfitted with a 12-foot gate, a cemetery filled with remote-controlled corpses, rats, a blood-spouting fountain and much more. Strawn's team also equipped the site with special lighting, a sound system and a fog machine to make it truly come alive at night. 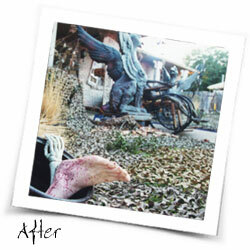 The metamorphosis from "ranch home to monster mansion" became and remained a big story with television, radio and print media from Dallas and beyond visiting the site through Halloween. News crews and reporters came daily to track the progress, notably traffic copters which seemed to swirl around the scene around-the-clock. The site drew over 3,000 curious onlookers in the days preceding Halloween, all of whom were all given AMC premiums including the festival film schedule. Our own video crew chronicled the transformation with stop-motion photography, which was included in a video news release about the sweepstakes, the festival and Blair which was distributed via satellite on Halloween eve. On Halloween Day, the little house in Dallas became the centerpiece of press coverage on the national front. Academy Award-winning makeup artist Ed French, of Nightmare on Elm Street and Terminator fame, dressed the	Mannings in movie-quality costumes, including custom-built prosthetics. The Mannings, their home and Linda Blair were featured on many leading national news programs, from Today and CBS This Morning to Entertainment Tonight, Access Hollywood and CNN. Print results included national stories by wire services like AP, front-page coverage in the Dallas Morning News and features in leading major market dailies like The Los Angeles Times. 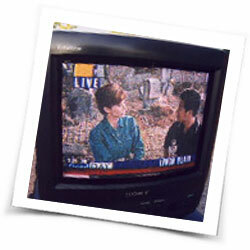 More than 125 news stations in the U.S aired the video news release. And more than 4,000 Dallas citizens came to visit the home on Halloween night. 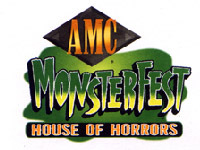 In the end, the sweepstakes helped AMC achieve an important objective: publicity and affiliate support that made this its most highly-rated Monsterfest. The event has since become a cornerstone affiliate promotable for AMC and its most lucrative advertising franchise.